The University Information Technology Services department comprised about three hundred career and student staff. We were responsible for the core technology infrastructure at the University of Arizona. As the Web Services Team Lead, I was responsible for most of the customer facing websites within UITS. 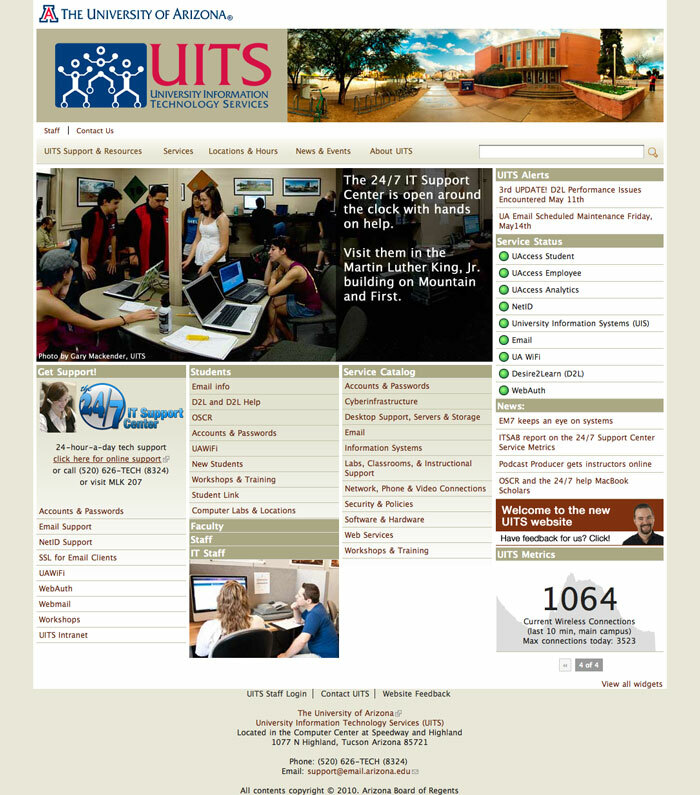 The main UITS website was our largest, and most visible website. During 2008 and 2009 we undertook a complete redesign of the site. We began with an analysis of our customers, both internal and external. We implemented a service catalog, in keeping with the ITIL practices adopted by our department. We also migrated several of the tools we had built for the Office of Student Computing Resources, most notability the workshop registration system. The new UITS website was built upon the Drupal content management system. This was our first large site built on Drupal. Our previous sites were built upon our own custom application framework. While the framework we built was great for the more data-heavy parts of a website, it was not designed for rapid update of major static content. This is something Drupal excels in out of the box. I was able to write some custom modules for Drupal that allowed our application framework to work within the Drupal content management system. This ultimately lead to an easy to update site, with powerful web application elements. Current alerts are pulled from a custom RSS feed system. Entries are posted in the administration site, which can send the alerts to multiple listservs and websites simultaneously. Two of the graphic designers on our team came up with the primary design and layout. I was responsible for the final HTML/CSS markup for the site. Various stats are pulled in real-time from our departmental monitoring system, Zabbix. Graphs are drawn via PHP, and composited with numbers and text. The workshop portion of the site is a web application that allows for users to view, register for, and see the history of workshops that they have taken. The first time we see a user, they are required to register with our system. This allows us to track their workshop history, and report out who has taken what workshops. We worked closely with the Workshop and Training team in UITS to make sure that their requirements are met on a timely basis. Workshops are required for access to many of the main enterprise systems on campus, such as payroll, time reporting, class scheduling, and much more. The accurate, reliable, and approachable workshop tools are essential for the smooth processing of access requests to the many enterprise systems. 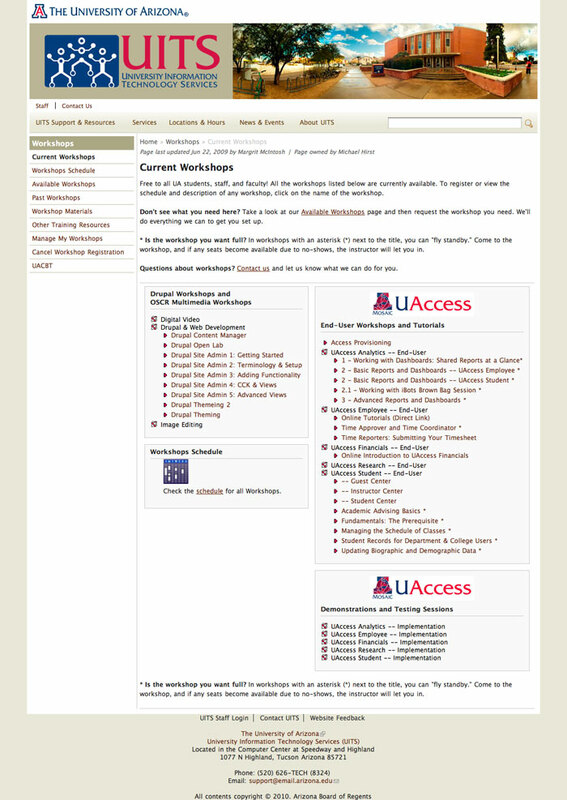 Workshops are scheduled and managed from the UITS / OSCR Administration site. The tools allow new types of workshops to be created, and allows workshops to be scheduled including instructor and location information as well as dates and times.